In this webinar, we discuss the basics of portfolio optimization. She discussed how to model and interpret portfolio optimization strategies, which strategy elements make the optimization problems more difficult to solve, and how to use the soft constraints and the constraint hierarchy to make the solution process more reliable. 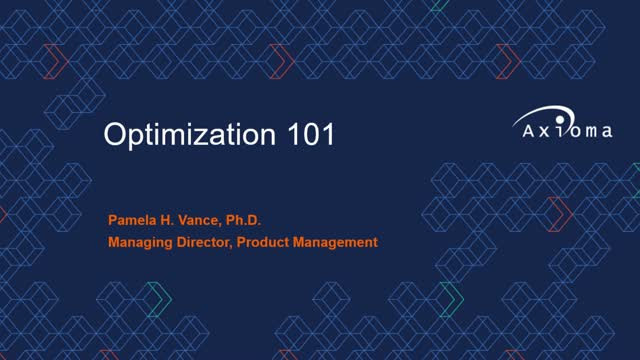 This presentation benefits industry participants who are new to optimization as well as long-time users who would like a refresher on the basics. In this quarterly webinar, we will review recent market events and discuss the key risk factors driving volatility in global markets with an emphasis on their impact on Asia Pacific portfolios. We will present investment insights from the nature of these key risk factors through the lens of Axioma’s fundamental multi-factor risk models and discuss their implications for portfolio managers. New regulations across the globe continuously intensify reporting demands and require more in-depth analytics and greater transparency. Asset managers can stay ahead of these data challenges with the help of Axioma Reporting Solutions. Our cloud-based platform delivers efficient cross-purposing of data together with the flexibility to respond to new and changing requirements. With the assistance of Axioma Reporting Solutions, asset managers use integrated workflows to aggregate, normalize, validate and store all necessary information, ensuring a smooth and timely reporting process. Our clients also receive access to a variety of reporting output formats and direct links to regulatory agencies. With built-in audit tools, such as internal control functionality and exceptions reporting, our clients can file confidently with complete reconciliation and review of the submission content. Additionally, Axioma’s global team of experienced team practitioners monitor any changes around the regulatory requirements and assist clients throughout their filing cycles. Sebastian Ceria, Founder and CEO, Axioma Inc.
To succeed in today's changing environment, firms must generate better returns. Additionally, they need to do it a more efficient and cost-effective way. Competition is increasing and margins are shrinking. Active managers felt it first, but competition has now spread to the passive space, too. Portfolio and risk management is undergoing a revolution. The technology landscape is changing and the analytics arms race is heating up, but which tech trends are worth paying attention to and what’s noise? In this webinar and Q&A, we’ll share our perspective on the tech landscape based on our research and conversations with the market. This presentation should benefit anyone interested in the future of technology and what it means in practice for institutional portfolio and risk management. A good stress test needs two ingredients. First, one needs to decide which variable(s) to stress and by how much. Second, comes the identification of a suitable calibration period for the covariance matrix used to estimate the other pricing factors. The latter can often be the more difficult, in particular if one does not want to simply rely on recent correlations to hold. In this webinar, Christoph V. Schon, Executive Director of Applied Research, will talk about the challenges he and his colleagues face (e.g. looking for relevant precedents or dealing with a lack of historical data) and how they deal with them, drawing from a number of recent studies conducted by the team. In this thought-provoking webinar, Omer Cedar, CEO and Founder of Omega Point, and Chris Martin, CAIA, CIPM, Director, Product Specialist at Axioma, expanded upon the techniques and insights from our most downloaded whitepaper and associated webinar: Adding Alpha by Subtracting Beta, which captured the attention of some of the industry’s leading active managers. Since its publication one year ago, we’ve worked with many fundamental managers to apply practical approaches that have helped them capture the alpha in their strategies, without changing underlying convictions or investment style. Viewers will gain an understanding of a practical approach to portfolio construction that can augment a fundamental investment process and help generate better risk-adjusted returns. Environmental, social and governance (ESG) data availability, marketing presence and regulation continue to increase in the investment community. Recent articles have highlighted several remarkable instances of score divergence between data vendors. Those articles did not attempt to determine whether the disparities represented isolated outliers or were a common occurrence in ESG data. Using a small set of different ESG vendors, Anthony Renshaw, Ph.D., Director of Index Solutions at Axioma, examined how pervasive ESG disparities are and what drives material differences in vendor scores. He also evaluated how those disparities impact portfolio construction. Environmental, social and governance (ESG) data availability, marketing presence and regulation have increased dramatically in the last few years. According to PwC’s 2016 ESG Pulse study, as recently as 2011, only 20% of the companies in the S&P 500 Index even reported ESG metrics; the percentage is now over 80%. In this webinar, Anthony Renshaw, Ph.D., Director of Index Solutions at Axioma discussed his recent whitepaper, ESG’s Evolving Performance: First Do No Harm where he evaluated the investment performance of ESG, paying particular attention to recent performance and highlighting the difference between ESG scores that overlap with traditional risk model factors and those that don’t. The last quarter of 2018 saw profound changes in the risk environment and multi-asset class correlations. While in early October, markets were still concerned about high inflation caused by strong labor conditions market and wage growth, traders have since dramatically lowered their interest rate expectations, fueled by ‘dovish’ Fed comments. In this webinar, Christoph V. Schon, Axioma's Executive Director of Applied Research, examined how portfolio risk has changed from very little diversification in a climate of inflation fears to a ‘flight-to-quality’ environment entirely dominated by stock market volatility.